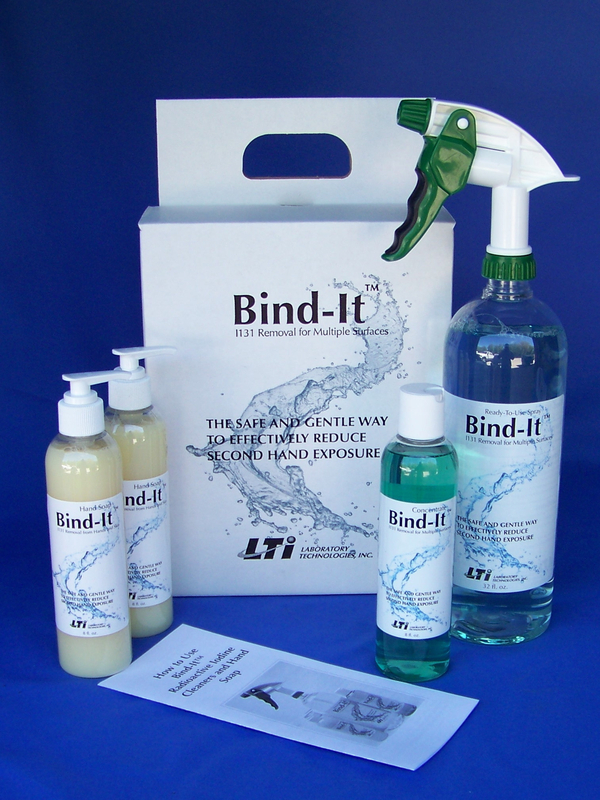 More then 20 years ago, in response to market need for a cost effective means to remove radioactive iodine contamination in laboratories, nuclear pharmacies and hospital nuclear medicine departments, we developed Bind-It™ concentrate and Bind-It™ hand soap. We have been supplying it to institutions ever since. As we are primarily a manufacturer of nuclear counting instruments, Bind-It was a secondary product for us that did not get much attention. In late 2010, we received a call from a woman whose husband was about to undergo radioactive iodine treatment for thyroid cancer. This lady was quite terrified about the prospect of her husband contaminating their home and the effect on their children. We explained to her that although Bind-It™ products were perfectly safe for use, they were not packaged for consumer use, we were only equipped at the time to sell to institutions. She purchased Bind-It™ hand soap, Bind-It™ concentrate and Bind-It™ Ready-to-Use by the case. This incident caused us to look further into the issue of what happens after a patient is administered Radioactive Iodine. What we found out was quite shocking. There is a tremendous amount of mis-information out there on the internet. Not only are completely unqualified people offering others advice about radioactive iodine, but they are spreading dangerously wrong information to unsuspecting thyroid patients. When we saw someone in a blog telling Radioactive Iodine patients that they should use a strong cleaner like bleach, it really hit home (bleach is known to cause iodine to vaporize, becoming gaseous). We decided to do something to change this. After quite a lot of research, we determined the best configurations of Bind-It™ for general consumer home use. We developed detailed instructions for using Bind-It at home (how and what types of surfaces will need cleaning). There is a real need and desire to protect families from second hand exposure to the radioactive iodine they are treated with. Now, your family can get the same level of protection from second hand exposure that hospital workers get with Bind-It™ Patient Care Packs.